TThe sharp clunking sound resonating from the front of my car reappeared with every dimple and depression in the gravel road leading down to the Little Carp River trailhead. It continued, that is, until we hit a pothole only yards from a parking space and then it was suddenly gone. If you�re thinking that divot miraculously cured whatever was ailing my vehicle then you would be very wrong. In the blink of an eye, our situation instantly became more complicated. We had not even set foot on the trail, and yet our time in the Porcupine Mountains was beginning on a grim note. Before I regale you with the details of our backcountry engineering, allow me to set the stage for this hiking trip. The idea for this hike was born during a conversation that took place while backpacking on Grand Island the previous year with two co-workers, Gabe and Derek. Ken and I were discussing the various places we have hiked when someone asked which place we enjoyed the most, overall. We pretty much agreed that the Porcupine Mountains had contained the nicest vistas and the best overall mix of terrain and trail difficulty. Casual conversation quickly turned into, "We should all plan a trip to the Porcupine Mountains next year." Before we knew it, several months had passed and it was time to begin making serious preparations. It had been several years since Ken and I last backpacked in the Porkies so we were ready for another excursion and the opportunity to see things we had not seen the first time around. 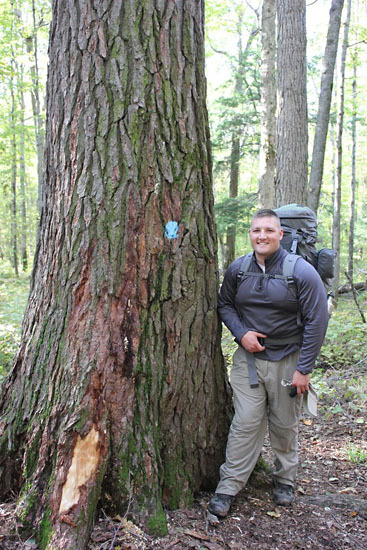 We did not want to hike all the same trails as we had in 2004, but we definitely wanted to include a couple trails and places that we felt epitomized the essence of the Porcupine Mountains, especially since our two co-workers had never visited the park. In addition to the hiking trails, we hoped to include several new locations during this visit. To that end, we planned only three days of actual backpacking on the park�s trails. The remaining days would be consumed by day hikes to various points of interest which included a couple abandoned copper mines, a B-17 crash site, Summit Peak, some waterfalls, and the Fourteen Mile Point Lighthouse, although the latter is not located near the park. As it turned out, Gabe was not able to go with us due to prior obligations. Derek had been in the Upper Peninsula prior to our trip so Ken and I began the long northerly drive by ourselves at 2:30 a.m. and planned to meet up with Derek once we neared the park. When we were about 20 miles outside Ontonagon we called Derek and agreed to meet at the Holiday gas station at the corner of Rockland and River St at the east end of town. We pulled in a short time later, topped off our gas tanks, picked up something unhealthy, albeit tasty for lunch, and drove over to the park headquarters 16 miles further west to register our stay. We entered the visitor center and approached the counter. Lynette, an approachable employee with an outgoing personality, greeted us and asked how she could help. She took down the usual registration information, provided us with the necessary paperwork, reviewed the park rules, asked what trails we had planned to hike, and then provided us with more information for our intended route. We thanked her for the advice and then walked away to browse the various displays in the interpretive room adjacent to the front desk. Before we walked out the front door Ken said, �Lynette seems like a pretty knowledgeable person. I bet if we ask her, she may be able to suggest some lesser known places for us to visit.� We mulled it over for a second, waited for her to finish speaking with another visitor, and then approached the desk a second time. We posed our question to Lynette and she, without hesitation, engaged us in additional conversation as she pulled out a pamphlet containing a map of the park. She laid the unfolded map on the counter between the four of us and asked, �Have you guys heard of the Nonesuch Mine?� Almost in unison we replied, �No.� She then circled its location on the map and told us exactly how to find it while driving down South Boundary road. She gave us just enough information about the mine and its history to piqu� our interest and get us hooked. After a brief pause, Lynette looked at us and asked, �What about the shipwreck just outside of the park? Do you guys know about that?� The three of us quickly glanced back and forth at each other with quirky smiles and looked back at her as I replied, �No. We�ve never heard about a shipwreck up here.� Lynette retrieved a new piece of paper from under the counter, placed it in front of us, and went on to explain some facts about the shipwreck. The Panama was a steam-powered, wooden-hulled bulk freighter that took its maiden voyage in May 1888. On November 21, 1906, the 275-foot Panama was traversing Lake Superior with a load of coal when it encountered a particularly violent storm. The stress compromised sections of the hull causing it to take on water. The captain ordered that the ship be run aground near Silver City, forcing the crew to abandon the ship and swim to shore. The cool part of the speech came when she revealed that a section of the wreck was actually visible from the shoreline near the Mineral River. We had never heard about the Nonesuch Mine or the Panama before speaking with Lynette, so we felt like we had just been handed a winning lottery ticket. We thanked her for the information and walked back to our cars as we discussed these two new revelations. The trails we chose to hike would not allow us to complete a loop through the park. Instead, we would begin near Overlooked Falls on the south side and hike north across the park. Consequently, we had to leave Derek�s car in the parking lot at the Lake of the Clouds overlook. Most of the drive north had been dreary and overcast and we experienced multiple periods of on and off rain, but when we exited our cars at the overlook, we stepped into bright, cheery surroundings with no signs of precipitation. This was a welcomed sight. 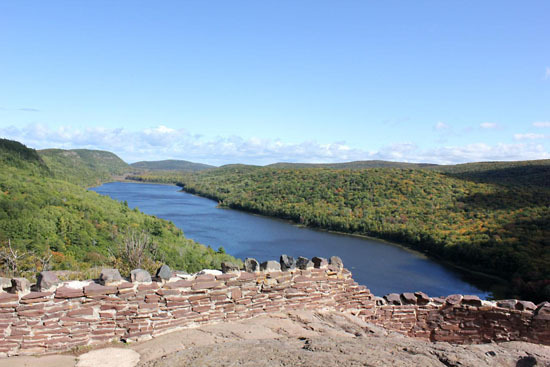 Lake of the Clouds, considered by many to be the crown jewel of the Porkies, is a nice sight down below at its lakeshore, but it is absolutely breathtaking when viewed from the Escarpment 300 feet above. The lake is nestled between several mountains and surrounded by thick, green, old-growth forest. The peaceful, serene sight caused us to linger for a while with several other park visitors, all of us jockeying about as we attempted to take photos and absorb the sweeping view from various angles. We made a final check of our gear, repacked a few items, stuffed our supplies and ourselves into my Saturn, and began the 24-mile drive to Overlooked Falls on the south side of the park. So, now we come full circle to where this story began several paragraphs ago. A few days before we embarked on this journey my car began to make a clunking sound every time I stepped on the gas after braking to a stop. Ken and I attempted to diagnose the problem during our drive north. We came to the conclusion that it possibly was a sticking brake caliper and the clunking sound was the pad breaking free as the wheel began to rotate. How wrong we were. As we rolled down Little Carp River Road toward the parking area, the clunking continued, even though I had not come to a stop. The noise ceased about 15-20 yards from a parking space, only to be replaced by a sound that I likened to a tree branch snagged by the undercarriage and dragging against the road. I stopped the car and Ken got out to take a look. As I slowly inched the car forward I saw the grimace on his face as he frantically waived for me to stop. I rolled down the passenger window and asked, �Not good?� He looked at me and sternly said, �Not good at all! That dragging noise you hear is the tire rubbing against the top of the wheel well. This is bad.� He then suggested that I very slowly and carefully attempt to back the car into a parking space. The sway bar on my car is secured by a large bolt that passes through the rear of the lower control arm and threads into the end of the sway bar. Somehow the threads failed and all the clunking for the last couple of days was the wearing away of the remaining threads on the bolt as the sway bar moved back and forth. The pothole merely supplied the force necessary to finally dislodge the sway bar from the bolt. I must admit, initially upon seeing the damage I figured there was no way to remedy this issue without getting a tow truck to haul my car to a local shop for repair, thus costing me an untold amount of money. Ken, however, was more optimistic and quickly said, �Brian, I think we can fix this right here!� Derek agreed and I listened to their suggestion. The concept was simple, just align the pieces and force them together. The actual mechanics of the procedure, however, bending back the hardened, one and one-half inch thick steel bar several inches, aligning it perfectly along the horizontal and vertical axes, and sticking it back on the bolt were borderline impossible. To this day, I still don�t know how we managed to pull it off. Although, having Derek, a state champ high school wrestler and college football player probably helped quite a bit. Plus, a little help from God didn�t hurt either. As it turned out, so many things had to work out in just the right time and sequence for this mechanical failure not to have been disastrous, that we all recognized the handiwork of Providence in the midst of the trouble. We now had a plan, but how would we physically accomplish the repair in the middle of a remote State Park without a shop full of tools? First we tried to push the bar back in place with a tree branch we found on the ground, then we tried a larger diameter branch, and finally we pick up what can only be described as a baby redwood. Well, maybe not quite that big, but it was really large. Pushing the sway bar with a section of dead tree did not work well. We needed more force�force that could only be supplied by some type of lever. At that moment I remembered the three-foot pipe I keep in my car for times when I need more leverage to remove lug nuts. I handed the pipe to Derek and he hammered it about four inches into the gravel with a rock. Now, we each had a task to oversee to complete the repair. I held the steering wheel all the way to the left to expose the working area and to keep the assembly from moving if the parts rubbed together. Derek supplied as much muscle to the pipe as he could muster to force the sway bar into position next to the protruding bolt. Ken watched the progress and said when to stop pushing since Derek was unable to see both parts from where he was kneeling. With the bar and the bolt aligned, Ken helped secure them until Derek could get a large rock to beat the two parts together. The entire backcountry fix took only 30 minutes from the time I removed the tire until everything was back in the car. It really was a small miracle! Our boots finally hit the Little Carp River Trail at 4:45 p.m.�much later than we had anticipated. We were only a short distance from the trailhead when we came upon the Overlooked Falls, a small gurgling falls just off the edge of the trail. We took a few photos and continued on. About a tenth of a mile past the falls we met an elderly husband and wife on their way back to the parking lot after completing a day hike in the area. As it turned out, they were the only people we encountered on the trail before we stopped for the night. In no time at all we had passed the Greenstone Falls, the Greenstone Falls cabin, and the Section-17 cabin. 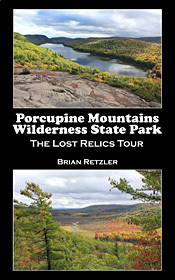 The Porcupine Mountains has several rustic backcountry cabins and yurts that visitors can rent throughout the year. Most of the cabins are available from April through November, while three of them are open all year. Many of the cabins sleep four persons, but a couple six and eight bunk cabins are also available. Each cabin is equipped with a table, chairs, bunks, pots, pans, plates, bowls, cups and utensils. A couple of cabins even have a boat with cushions and oars. 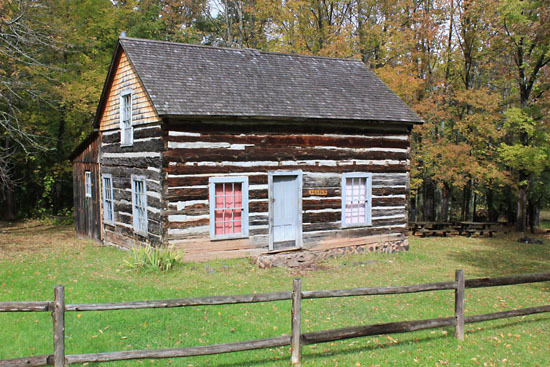 The cabins are scattered throughout the park and range from one to four miles from their respective parking areas. A fork in the trail appeared shortly after we passed the Section-17 cabin. We veered to the right, leaving the Little Carp River Trail, and progressed in a northwesterly direction on the Cross Trail. Overall, the ground was fairly level with only a few rolling hills, a couple of steep climbs and descents, and the ever-familiar tapestry of exposed tree roots covering the trail. The generally easy terrain allowed us to fly down the trail, which turned out to be a blessing due to our late start. Eventually we began a long, steep descent that brought us down to the bank of the Big Carp River. Our first day was almost over, or so we thought. The trail paralleled the river for a short distance as it carried us past the Big Carp 4-bunk cabin and then led us to the bridge over the Big Carp. A short path near the bridge provided easy access to the Lake Superior shore. It was now about 7:00 p.m. and the sun was quickly approaching the horizon, painting the entire landscape with golden colors that are typical for this time of day. Time was not in our favor, but we stopped for several minutes anyway. The wind blowing in from the north was cool and refreshing and the view was spectacular. As we stood near the lake a bald eagle flew north over the mouth of the Big Carp, banked to its right, and flew east down the rocky shoreline. The timing was perfect and was almost as if the majestic bird had seen us coming and wished to greet us by performing a fly by. The last time we hiked here, we stayed at a campsite along the Big Carp River Trail, a little ways south of the Lake Superior shore. After retrieving our packs we walked south for what we thought would be just a couple of tenths of a mile hike to our campsite. I once heard an old proverb that went something like this, �The faintest pencil mark is better than the strongest memory.� Well, that apparently was the case this time. After what was probably two or three tenths of a mile we had yet to find the campsite. Ken and I remembered the layout of the site and where it sat in relation to the trail but it was nowhere to be found. When we turned around and hiked back to the north, Ken and I walked a line through the woods and Derek walked the trail. Surely, we missed the site. When we arrived back at the Big Carp 6-bunk cabin along the shore we realized there was no campsite here anymore, even though the map indicated its presence. It obviously had been removed. On the way south we had seen a campsite down near the river. In fact, we walked down a steep grade to reach it, only to realize that it was not an �official� campsite even though the area was flat and well-worn. During registration we were informed that official campsites would contain a metal fire ring. The fire pit here was just a flat area surrounded by several large rocks in a circular formation. 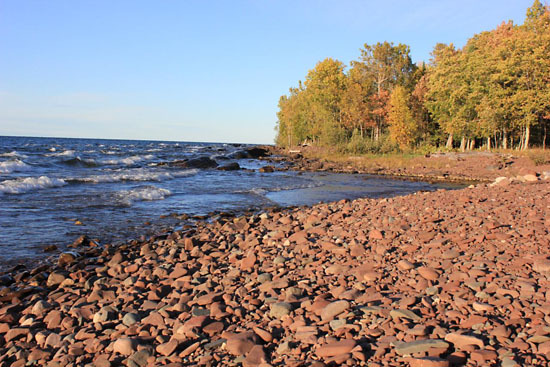 We understood that this location was not the preferred place for us to spend the night so we made our way across the Big Carp to find one of the several campsites right along the Lake Superior shore. By now, the sun had almost completely set and the inky black of night was nipping at our heels. We began walking down the trail in search of a suitable tent site. 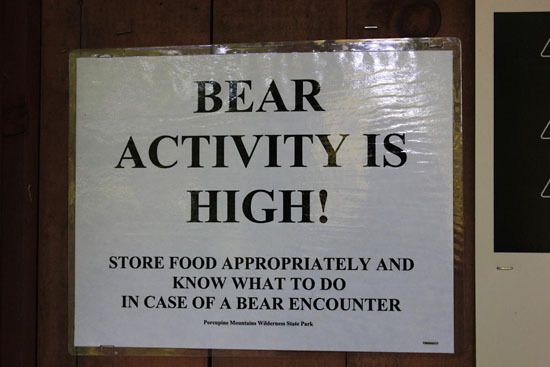 We found a bear pole early on, but it had been knocked over and was lying on the ground. Even though the bear pole was not functional, we figured there at least had to be one site nearby, however, we never saw any tent symbols in the area. We kept walking. We discovered several areas along the shore that could possibly have been campsites, but we were unable to find a bear pole and there were no metal fire rings. Another site had no fire ring but did have a bear pole about 60 feet away. That would have been useless because it was way too close to where we would have cooked, ate dinner, and set up our tents. We stopped and checked the map. This was becoming very frustrating! How could three guys, who are used to reading maps for a living, not find at least one official site out of the four or five that we should have passed? The sun eventually set and we continued our search in the darkness after firing up our headlamps. We still could not find a site and contemplated staying along the shore. The only problem was the �sites� were either uneven, loaded with rocks, or littered with tree limbs and roots�it would have been almost impossible to set up two tents here. Additionally, it was becoming extremely cold and windy and attempting to keep a stove lit long enough to cook dinner would have been quite a challenge, not to mention, the strong wind would have made for a long, cold night for sleeping. We were now tired, hungry, and cold. I put on my fleece top and a knit hat as we discussed what to do next. After some deliberation, we reluctantly made our way back to the unofficial site next to the Big Carp River. We made our way through the woods with three beams of light illuminating the trail in front of us. Night hiking�this was a first for me. We reached the site at roughly 8:45 p.m., set up our tents, unpacked, threw on some more warm clothes, cooked dinner in the dark, and finally got to eat at 9:30 p.m. Despite the car trouble, late start, and inability to find an officially sanctioned tent site, it had still been a good day. The sway bar was fixed, we had a comfortable temperature for hiking�probably 50-52 degrees�we didn�t get rained on, there had been no bugs, we had great scenery, and we were now relaxing and eating a hot meal in the great outdoors. After dinner, we hung our food and sweet-smelling items from a tree and sat around in the dark enjoying some good conversation before finally going to bed with the wind whooshing through the trees and the muffled sound of waves crashing on the shore in the distance. Final count for the day: Three good Samaritans who asked if we needed help while working on the car, two people on the trail, a couple of waterfalls, two red squirrels, a doe and its fawn just off the trail, and one bald eagle.